What’s Going On – Taste Live At The Isle Of Wight Festival tells the story of the Irish rock band Taste. Formed in Cork, Ireland in 1966 by Rory Gallagher, Taste released two studio albums in 1969 and 1970, disbanding shortly after their legendary appearance at the 1970 Isle of Wight Festival. The core of What’s Going On features the band’s performance at the festival, but the film, which came out on DVD last year and has been making the rounds at film festivals, includes contributions from Gallagher’s brother and Taste road manager Donal Gallagher along with Brian May (Queen), The Edge (U2), Bob Geldof and jazz man Larry Coryell. 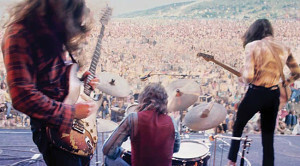 Taste’s performance at the festival was so well received that when Jimi Hendrix was asked, “How does it feel to be the best guitarist in the world,” he replied, “I don’t know, why don’t you go and ask Rory Gallagher?” The 16mm film has been restored and the sound remixed for the film. Director Murray Lerner phoned us from his Long Island City home to talk about the movie. Talk about shooting the original footage. What was that experience like? It was incredible. I’ve never experienced anything like it because of the huge crowd and the intensity of the performers. It was overwhelming actually. I was trying to do a much broader film than I had done before, combining the background and business aspect with the music and the feelings of the crowd. I was there for two weeks in advance of the festival and two weeks afterward. We pre-lit the promoters’ offices so if there was anything major happening we could rush there and flip the switch and the lights were on. They cooperated on that level. They were fascinated with the idea of being filmed even though a lot of what they did in their offices was not so kosher. Were you familiar with the band Taste before you went to the festival? No. I was not familiar. It was a surprise to me. I knew a lot about Irish music, but Irish folk music. I had been to Ireland a number of times. I had traveled with the Clancy Brothers. I didn’t know anything about this aspect at all. It was a major surprise. I was excited by it. It was very stimulating and exciting. What made Rory Gallagher so mesmerizing? He was an unbelievable performer. He was a great guitarist. He still has a reputation among other guitarists of being a genius. Where that all came from, I don’t know. I was very involved with Irish folk music and how the American blues was able to influence him was amazing. I didn’t think of the Irish as being influenced by blues but they were. They felt an affinity with black people. They were oppressed the way the blacks in America were oppressed. They were conscious of that. It’s a little sad he died so young, but he was technically a major guitarist on a level with any other major guitarist. I think he still has that reputation. What inspired you to revisit the footage of Taste performing? The Gallagher family came to me and wanted to do it. His brother and his nephew were supportive. The nephew became the co-producer. His brother was his manager. That’s in the film. I’ve been trying to do it for a long time but could never come to an agreement about the rights with them. All of a sudden, they wanted to do it. That’s how those things happen. It takes years sometime for the rights and money to come together. They got me the money to do it. How’d you get the Edge to participate? I had heard he was a fan. I knew him a little bit. We had some connection, I don’t remember what. How did Brian May get involved? That was the most unusual. Eagle Rock was doing a film with him. I heard he was available for an interview and he was very influenced by Rory. More than very influenced, he still uses his sound and owes a great debt to him, he feels. That’s how we got that. And what about the jazz player Larry Coryell, who describes Gallagher’s playing as “avant-garde jazz”? I knew him from before. He’s a great guitarist. I thought his viewpoint might be interesting in terms of evaluating his technique. The whole thing has gotten fantastic reviews. I think it’s one of the best films I’ve ever made. I wasn’t planning to have it that way. We have had several showings with crowds and the reaction is unbelievable. They’re applauding throughout. It’s rare that there is so much applause for music during a music film.